At last, you determine your phone spending. The smart and simple way to define your phone budget. 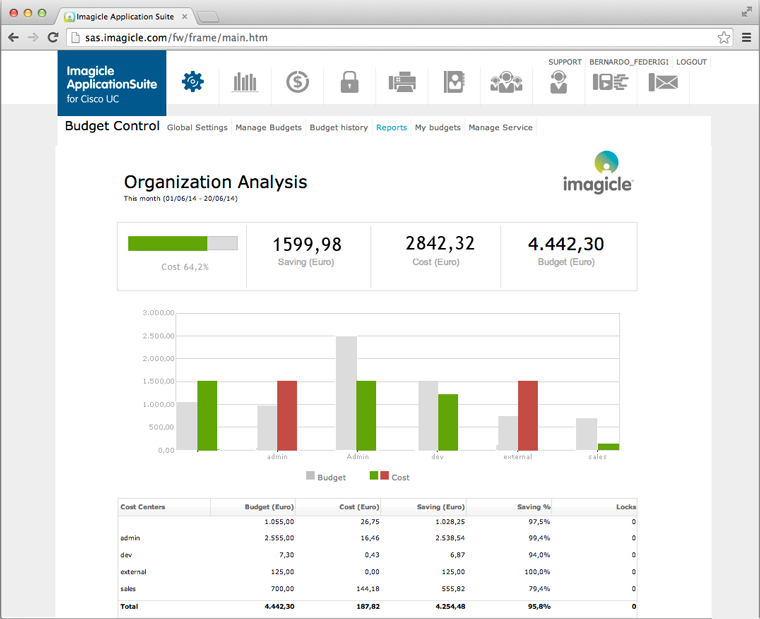 With Imagicle Budget Control, you can intelligently assign a budget for the calls of each user, department and cost center. You can receive notices when the spending budget is exceeded and lock the phone, to prevent unauthorized calls. This is the ideal complement to Imagicle's billing solutions. When the budget or pre-set threshold is reached. You can also receive regular budget use summaries. Automatic thanks to Phone Lock to prevent any more telephone calls from being made once the budget has been reached. With pre-set reports to best plan future budgets and improve your company's telephone use. credit in real time in Jabber Desktop. Depends on the Imagicle Billing module. Each period per user, cost center or department. Automatic budget renewal for the next period. You can assign any savings made during the period as credit for the next period. Audit file available, including reports usage and relevant data visibility. You can schedule alarms notifying you via e-mail of cost overruns or when a certain threshold percentage has been exceeded. A budget usage summary is automatically sent at the end of the period to the administrator, budget manager or each user. Notification of budget allocation or failed telephone lock. When the budget is reached via Imagicle Phone Lock. 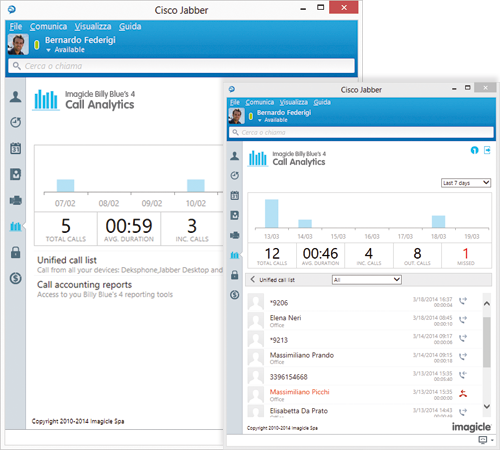 View telephone expenses and residual credit in Jabber Desktop in real time. Winter 2019 release is here. Available as of January 28th 2019. Determine your phone spending in advance. Often the phone bill brings with it unpleasant and unexpected surprises. With Imagicle's billing solutions, you can precisely monitor your company's telephone spending, but, as the saying goes: "Prevention is better than a cure". 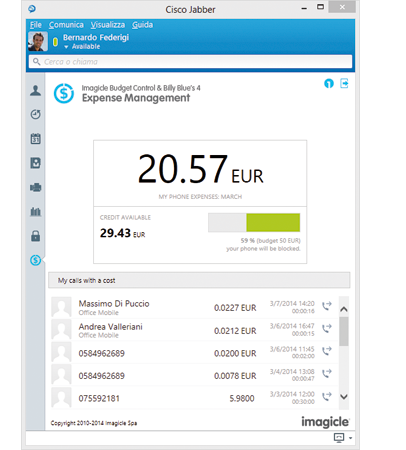 With Imagicle Budget Control, you can decide in advance how much you want to spend, monitor your budgets in real time and automatically lock your company's phones to avoid nasty surprises when the phone bill arrives. Phone bills can come with unpleasant and unexpected surprises. as the saying goes: "Prevention is better than a cure". Easily assign a budget for your employees. 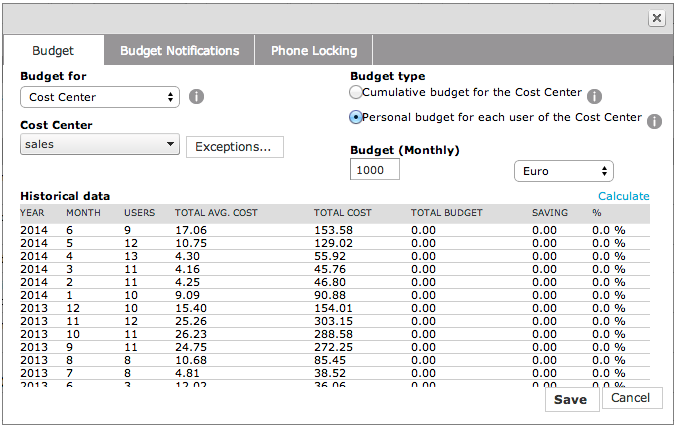 Assign a weekly or monthly budget to each user, cost center (e.g. a specific subsidiary) or department, based on analyses of previous periods. The budget is automatically renewed for the next period, and if you wish, you can also decide to assign any savings from the previous period as a credit to the next one. 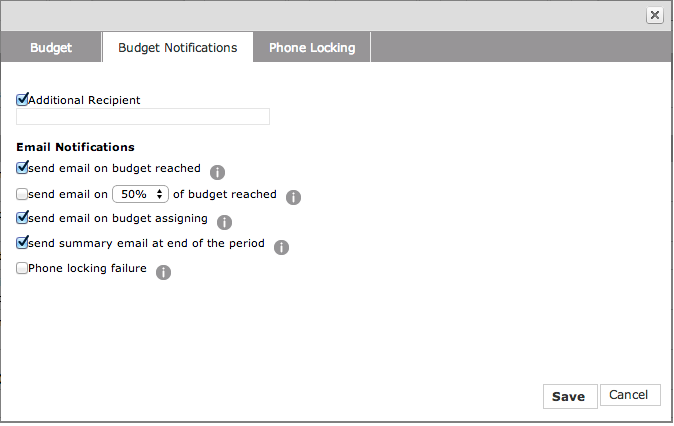 When the budget is reached, or a certain threshold exceeded, Imagicle Budget Control immediately sends an alarm e-mail. 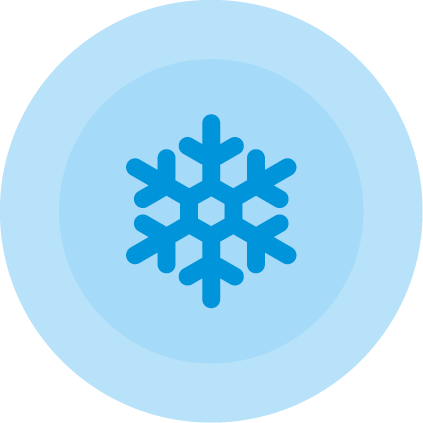 You can also automatically receive an e-mail with a practical summary of budget use at the end of the period and be notified if, for whatever reason, a phone is not locked properly. Analyze past budgets to optimize future ones. Thanks to pre-set, ready-to-use reports, you get a complete view of budgets assigned, cost overruns and savings, evaluating changes over time, both at a company level and department, cost center or user level. Exported in PDF or MS Excel format. Automatically lock phones when the budget has been reached. Thanks to its integration with Imagicle Phone Lock and Billy Blue's 4, you can automatically lock phones when the budget is reached, avoiding uncontrolled increases in telephone spending. This prevents users from making outgoing calls except to numbers defined by the administrator (e.g. emergency numbers).  It was only natural that the European Institute of Oncology, a non-profit research organization for cancer prevention, diagnosis and treatment, also be a pioneer in managing its communication. 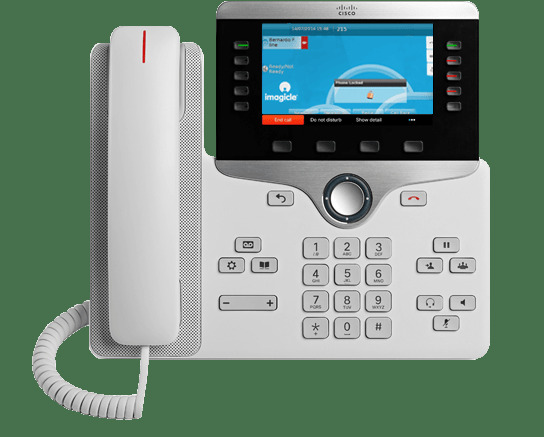 The ACD directs its calls from the Cisco UCM to operators equipped with Imagicle operator consoles who see the caller's name and details in real time thanks to integration with company directories. 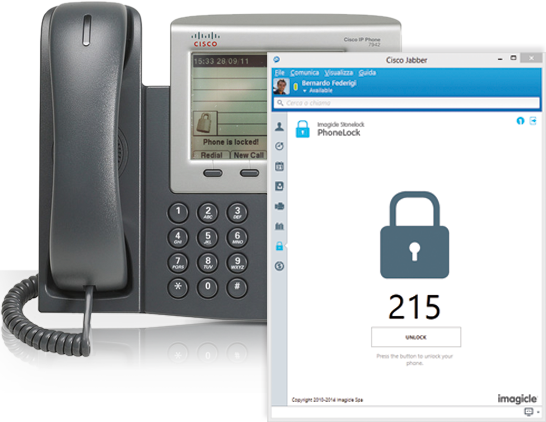 Telephone traffic of the 500 users is constantly monitored by the accounting & billing solution, and all users can now send and receive faxes directly from their computer, smartphone or tablet. 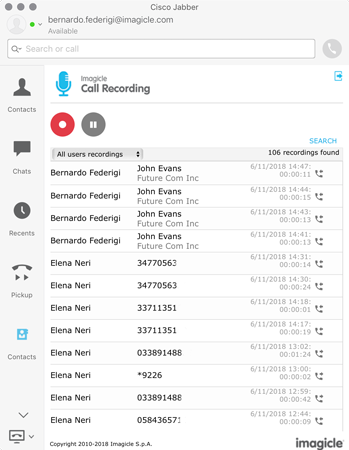 In creating the new telephone infrastructure based on Avaya Aura, serving the various sites and operating units, with a total of some 10,000 users, the government of Italy's richest and most heavily populated region chose Imagicle for its UC apps. 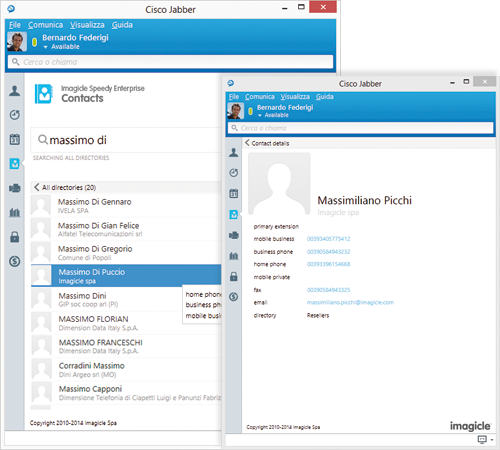 In particular, thanks to Imagicle solutions, the Lombardy region got rid of all of its traditional fax machines, virtualizing the service and integrating it with multifunction printers provided to employees. At the same time, the telephone traffic control solution was used to perform in-depth analysis of all numbering plans. with all the apps you need. Ideal for Avaya, Aastra, Alcatel, Unify (Siemens) platforms and for other UC systems. Complete your Microsoft Skype for Business, adding those missing services users can't miss. Budget Control is distributed as an additional module for Imagicle Accounting Billing for Cisco, Cross Platform and Lync. Check out the architecture you are interested in. Automatic telephone locking is described on the Imagicle Phone Lock page. 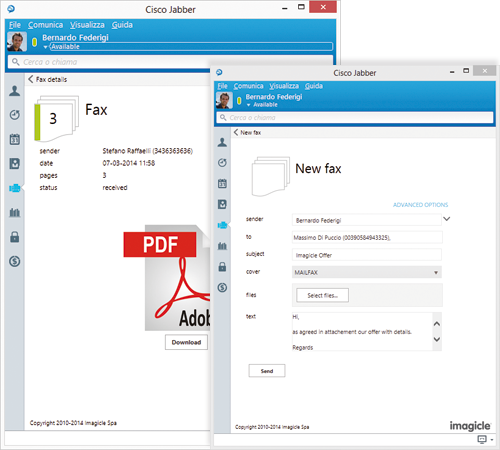 Imagicle Budget Control is distributed as an additional module for Imagicle Accounting Billing for Cisco, Cross Platform and Lync. Compatibility depends on the solution to which Budget Control is added as a module (see also compatibility on the page of the product of interest to you). For automatic telephone locking, see compatible platforms and telephones on the Imagicle Phone Lock page.